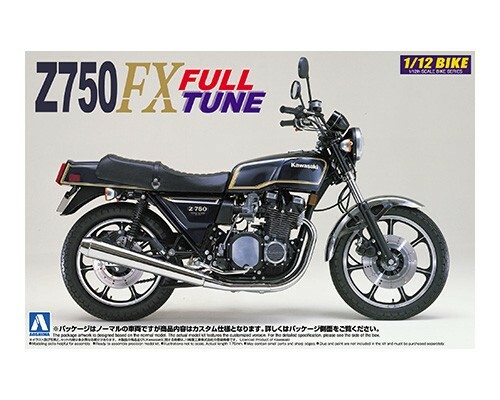 1/12 scale model kit of specially tuned-up KAWASAKI Z750FX. The whole length: 175mm, The whole width: 60mm The whole height: 110mm. Ignition Wire, Brake Hose, Wires, etc. are authentically re-created by vinyl pipes. As special parts, fancy parts such as Wheels, Muffler, Disk, Step, Swing Arms, Oil Cooler and Rear Suspension, etc. equipped. Ultimate full custom version.